In the spring of 1891 I gave my demonstrations with a high frequency machine before the American Institute of Electrical Engineers at Columbia College, which laid the foundation to a new and far more promising departure. Altho the laws of electrical resonance were well known at that time and my lamented friend, Dr. John Hopkinson, had even indicated their specific application to an alternator in the Proceedings of the Institute of Electrical Engineers, London, Nov.13, 1889, nothing had been done towards the practical use of this knowledge and it is probable that those experiments of mine were the first public exhibition with resonant circuits, more particularly of high frequency. While the spontaneous success of my lecture was due to spectacular features, its chief import was in showing that all kinds of devices could be operated thru a single wire without return. This was the initial step in the evolution of my wireless system. The idea presented itself to me that it might be possible, under observance of proper conditions of resonance, to transmit electric energy thru the earth, thus dispensing with all artificial conductors. Anyone who might wish to examine impartially the merit of that early suggestion must not view it in the light of present day science. I only need to say that as late as 1893, when I had prepared an elaborate chapter on my wireless system, dwelling on its various instrumentalities and future prospects, Mr. Joseph Wetzler and other friends of mine emphatically protested against its publication on the ground that such idle and far-fetched speculations would injure me in the opinion of conservative business men. So it came that only a small part of what I had intended to say was embodied in my address of that year before the Franklin Institute and National Electric Light Association under the chapter "On Electrical Resonance." This little salvage from the wreck has earned me the title of "Father of the Wireless" from many well-disposed fellow workers, rather than the invention of scores of appliances which have brought wireless transmission within the reach of every young amateur and which, in a time not distant, will lead to undertakings overshadowing in magnitude and importance all past achievements of the engineer. Fig. 1. Alternator of 10.000 Cycles p.s., Capacity 10K.W.. Which Was Employed by Tesla in His First Demonstrations of High Frequency Phenomena Before the American Institute of Electrical Engineers at Columbia College, May 20, 1891. Fig. 2. Diagram Illustrating the Circuit Connections and Tuning Devices Employed by Tesla In His Experimental Demonstrations Before the American Institute of Electrical Engineers With the High Frequency Alternator Shown in Fig. 1. Fig. 3. Electric Transmission Thru Two Wires and Hydraulic Analog. Fig. 4. Electric Transmission Thru a Single Wire Hydraulic Analog. Fig. 5. Illustrating Typical Arrangements for Collecting Energy In a System of Transmission Thru a Single Wire. Fig. 6. Diagram Elucidating Effect of Large Capacity on One End. Fig. 9. 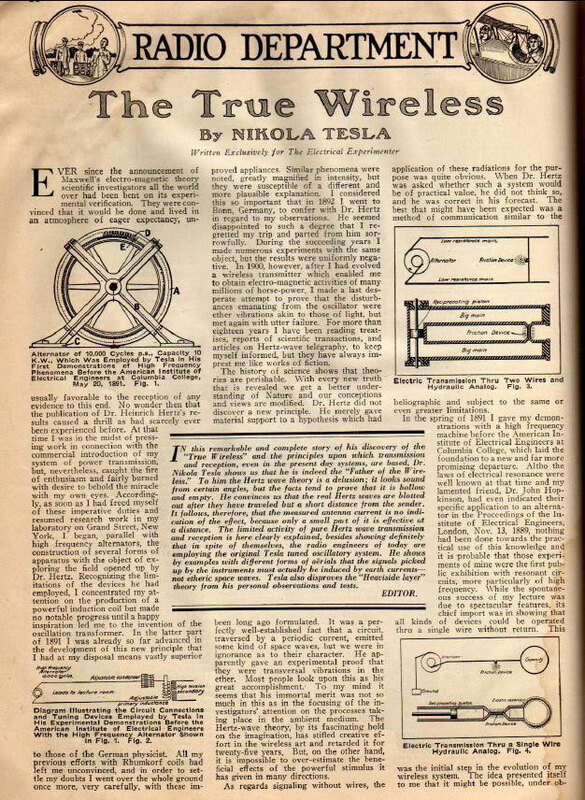 The Forerunner of the Audion-the Most Sensitive Wireless Detector Known, as Described by Tesla In His Lecture Before the Institution of Electrical Engineers, London, February, 1892. Possibly the most important advances during the following three or four years were my system of concatenated tuned circuits and methods of regulation, now universally adopted. The intimate bearing of these inventions on the development of the wireless art will appear from Fig. 10, which illustrates an arrangement described in my U.S. Patent No. 568,178 of September 22, 1896, and corresponding dispositions of wireless apparatus. The captions of the individual diagrams are thought sufficiently explicit to dispense with further comment. 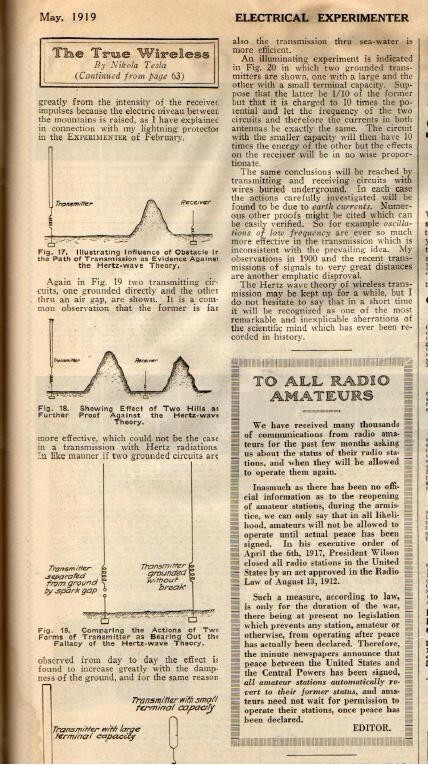 I will merely remark that in this early record, in addition to indicating how any number of resonant circuits may be linked and regulated, I have shown the advantage of the proper timing of primary impulses and use of harmonics. In a farcical wireless suit in London, some engineers, reckless of their reputation, have claimed that my circuits were not at all attuned; in fact they asserted that I had looked upon resonance as a sort of wild and untamable beast! Fig. 10. Tesla's System of Concatenated Tuned Circuits Shown and Described In U. S. Patent No. 568,178 of September 22, 1896, and Corresponding Arrangements in Wireless Transmission. Fig. 11. 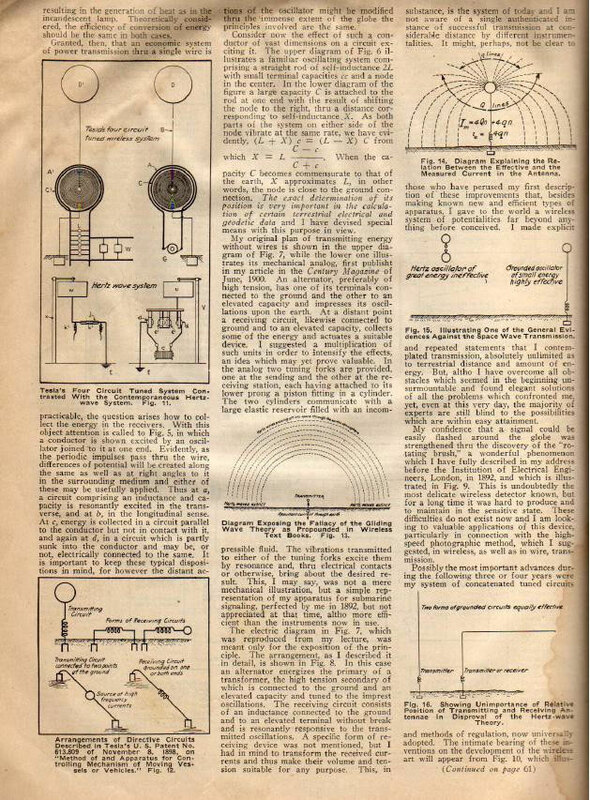 Tesla's Four Circuit Tuned System Contrasted With the Contemporaneous Hertz-wave System. The prevailing misconception of the mechanism involved in the wireless transmission has been responsible for various unwarranted announcements which have misled the public and worked harm. By keeping steadily in mind that the transmission thru the earth is in every respect identical to that thru a straight wire, one will gain a clear understanding of the phenomena and will be able to judge correctly the merits of a new scheme. Without wishing to detract from the value of any plan that has been put forward I may say that they are devoid of novelty. So for instance in Fig. 12 arrangements of transmitting and receiving circuits are illustrated, which I have described in my U.S. Patent No. 613,809 of November 8, 1898 on a Method of and Apparatus for Controlling Mechanism of Moving Vessels or Vehicles, and which have been recently dished up as original discoveries. In other patents and technical publications I have suggested conductors in the ground as one of the obvious modifications indicated in Fig. 5. Fig. 12. 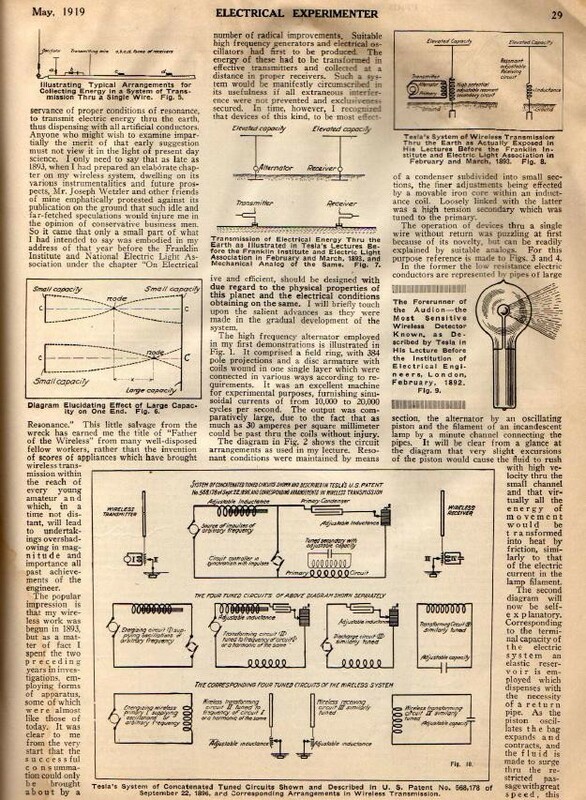 Arrangements of Directive Circuits Described In Tesla's U. S. Patent No. 613,809 of November 8. 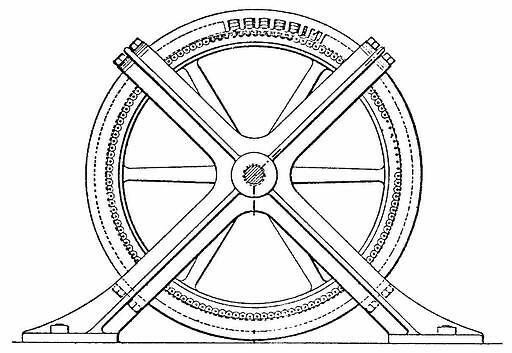 1898, on "Method of and Apparatus for Controlling Mechanism of Moving Vessels or Vehicles." In Fig. 13 a transmitter is shown radiating space waves of considerable frequency. It is generally believed that these waves pass along the earth's surface and thus affect the receivers. I can hardly think of anything more improbable than this "gliding wave" theory and the conception of the "guided wireless" which are contrary to all laws of action and reaction. Why should these disturbances cling to a conductor where they are counteracted by induced currents, when they can propagate in all other directions unimpeded? 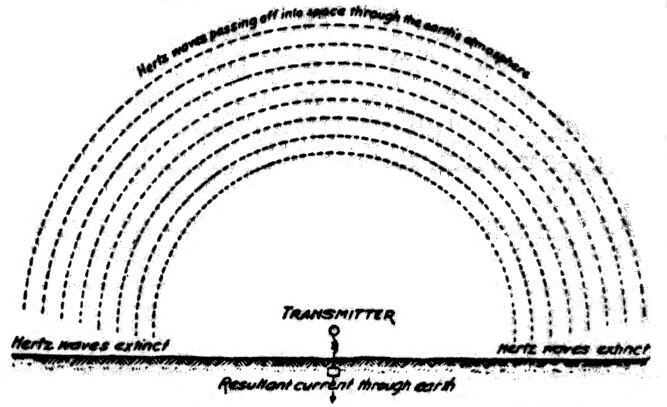 The fact is that the radiations of the transmitter passing along the earth's surface are soon extinguished, the height of, the inactive zone indicated in the diagram, being some function of the wave length, the bulk of the waves traversing freely the atmosphere. Terrestrial phenomena which I have noted conclusively show that there is no Heaviside layer, or if it exists, it is of no effect. It certainly would be unfortunate if the human race were thus imprisoned and forever without power to reach out into the depths of space. 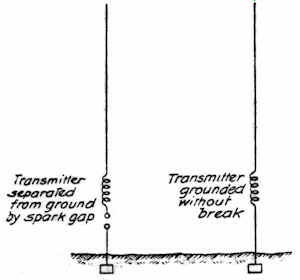 The actions at a distance cannot be proportionate to the height of the antenna and the current in the same. I shall endeavor to make this clear by reference to diagram in Fig. 14. The elevated terminal charged to a high potential induces an equal and opposite charge in the earth and there are thus Q lines giving an average current I=4Qn which circulates locally and is useless except that it adds to the momentum. A relatively small number of lines q however, go off to great distance and to these corresponds a mean current of ie = 4qn to which is due the action at a distance. The total average current in the antenna is thus Im = 4Qn + 4qn and its intensity is no criterion for the performance. 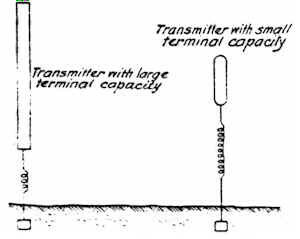 The electric efficiency of the antenna is q/Q+q and this is often a very small fraction. It occurs to me here to ask the question—why have the Hertz waves, been reduced from the original frequencies to those I have advocated for my system, when in so doing the activity of the transmitting apparatus has been reduced a billion fold? I can invite any expert to perform an experiment such as is illustrated in Fig. 15, which shows the classical Hertz oscillator altho we may have in the Hertz oscillator an activity thousands of times greater, the effect on the receiver is not to be compared to that of the grounded circuit. This shows that in the transmission from an airplane we are merely working thru a condenser, the capacity of which is a function of a logarithmic ratio between the length of the conductor and the distance from the ground. The receiver is affected in exactly the same manner as from an ordinary transmitter, the only difference being that there is a certain modification of the action which can be predetermined from the electrical constants. It is not at all difficult to maintain communication between an airplane and a station on the ground, on the contrary, the feat is very easy. Fig. 18. 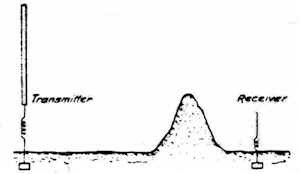 Showing Effect of Two Hills as Further Proof Against the Hertz-wave Theory. Again in Fig. 19 two transmitting circuits, one grounded directly and the other thru an air gap are shown. It is a common observation that the former is far more effective, which could not be the case with Hertz radiations. In a like manner if two grounded circuits are observed from day to day the effect is found to increase greatly with the dampness of the ground, and for the same reason also the transmission thru sea-water is more efficient.